Succulent recipes in sauce or in jelly your senior dog will simply love, specially crafted for his needs, in convenient pouches: the perfect format for succulent fresh meals. Served on their own or on top of his dry food, they will turn mealtimes into delicious moments of joy for him... and for you. 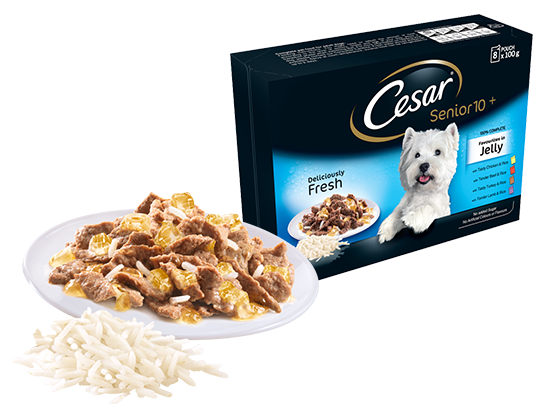 And because all CESAR® recipes are healthy and 100% complete, your dog can enjoy them as often as you like. Succulent recipes in sauce or in jelly your senior dog will simply love, specially crafted for his needs, in convenient pouches: the perfect format for succulent fresh meals. You might need to adjust the amount of food according to the level of activity, breed and age of your dog. Allow a transition phase when switching diet. For more information on feeding your dog, please contact our Consumer Careline. Fresh water should always be available. Serve at room temperature, surplus food can be refrigerated for up to 2 days. Your dog can be regarded as senior from 10 years old. We recommend to feed a mix of senior wet and dry food. 87 kcal = 100 g See pack for full feeding instructions.